MONTREAL – Kevin Glenn picked up right where he left off after leading Calgary to a Grey Cup appearance last November, passing for 268 yards on 22 of 28 passing as the Stamps defeated the Montreal Alouettes 22-14 Friday night at Percival Molson Stadium. Rene Paredes pitched in with five field goals while Nike Lewis and Brad Sinopoli each added 81 yards receiving in the Calgary victory. Glenn was taking over behind centre after starter Drew Tate went down with a strained forearm late in Week 2’s contest with Saskatchewan. It was a year ago to the day that the veteran quarterback stepped in for Tate in Montreal, helping lead them to a second-place finish before Tate returned late in the year. As for the Alouettes, the week leading into Friday’s contest was like no other with both players and coaches answering questions about a Week 2 performance where they produced just 161 yards of total offence and were forced to punt 24 times by a stingy Winnipeg Blue Bombers defence. Following the game, the usually calm Anthony Calvillo called the performance “disgusting”. Promising a better output this week, Calvillo and the Alouettes offence silenced their critics as quickly as possible, engineering a brilliant 11-play, 81-yard scoring drive, finding WR Brandon London in the endzone for an acrobatic 19-yard touchdown and an early lead. Already without Tate, the Stamps offence was also missing second-year receiver Maurice Price who sat out with an injury. It took Glenn some time to get in rhythm but the veteran found his way as the Stamps marched into the second quarter, leading back-to-back drives ending in Rene Paredes field goals from 21 and 20 yards out. With Montreal up 7-6, Glenn continued to show veteran poise, leading the Stampeders 70 yards down the field before putting the ball in the endzone to take a 13-7 advantage. Scrimmaging from the nine yard line, Glenn’s pass was tipped at the line of scrimmage but landed right into the hands of Lewis who fell back over the goal line for the major. The Stamps defence then hunkered down, holding Calvillo to only 92 yards passing and didn’t allow the Als over their side of centre after Montreal’s opening drive. 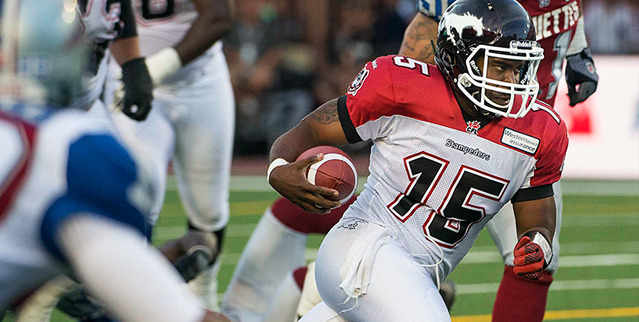 The Stamps seemed poised to take a stranglehold on the game with an impressive possession early in the third quarter. First, Glenn found non-import quarterback-turned-receiver Sinopoli down the sideline for a smart one-handed catch for 41 yards, before connecting with Lewis for an 18-yard gain to set Calgary up at the Montreal one yard line. However a goal line stand by the Als forced Calgary to kick a field goal and only up their lead to 16-7. Calgary’s defence continued to confuse Calvillo and the Als, forcing another stop and countering with a 39-yard Paredes field goal to extend the score to 19-7. Calvillo began to find his receivers midway through the final frame, spotting SB Arland Bruce lll twice in stride, one of which was a 33-yard gain. But scrimmaging from the Calgary 43 yard line, the Als elected to go for it on third-and-two and Calvillo rolled out looking for RB Brandon Whitaker only to have the pass knocked down by linebacker Deron Mayo to force the turnover on downs. Calgary’s defence was unrelenting on the ensuing Als possession as Charleston Hughes knocked Calvillo’s arm, forcing the fumble and the ball was recovered by defensive lineman Demonte’ Bolden. With the Als offence unable to solve the Stamps, it was the special teams that stepped up to get Montreal right back into the game. Second-year defensive back Ed Gainey, leaped in front of a Rob Maver punt, recovering his own block and returning it 38 yards for a touchdown while cutting the lead to 19-14 with just over three minutes remaining. That was as close as Montreal would get however as the Stamps defence swarmed Calvillo on the final two drives and Paredes nailed a clutch 39-yard field goal with 47 seconds remaining to seal a 22-14 Stampeders victory. Calvillo finished with a modest 205 yards and one touchdown on 22 of 36 passing. Bruce lll led the Als in receiving with 5 catches for 80 yards. The two teams complete a home-and-home next Saturday when they meet at McMahon Stadium in Calgary.